Hier erhalten Sie einen Überblick über den Stand der Pädiatrischen Onkologie und Hämatologie in Deutschland. Weiterhin werden Fachgesellschaften und Organisationen in Deutschland, Europa und der Welt vorgestellt. Diversity and proportional composition of childhood cancers. 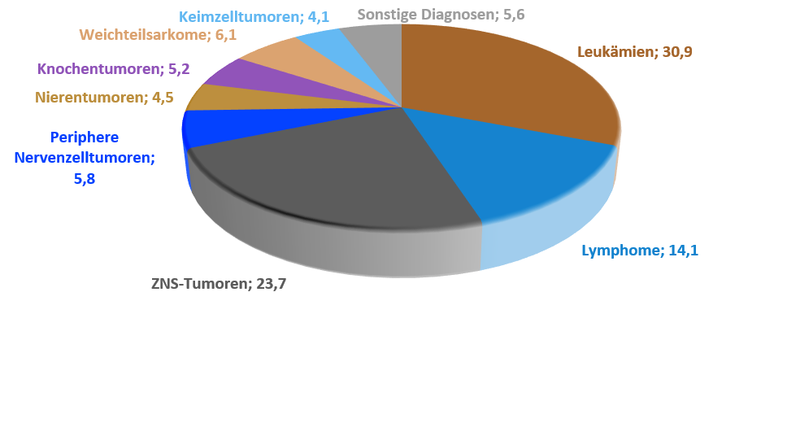 Source: German Childhood Cancer Registry (GCCR). The most common paediatric malignancies in Western societies are leukaemias (34%), tumours of the central nervous system (20%) and lymphomas (13%). When suspecting cancer in a young patient, when taking care of the various problems of a childhood cancer survivor as a family physician or paediatrician, when being responsible as a caregiver during the intensive treatment on the oncology ward, or when, as a scientist, dealing with the current scientific and political challenges that paediatric oncology is facing in Europe today: Childhood cancer affects us all! Until the late 60ies, “Your child has cancer.” was like a death sentence, because the chance of cure was below 20% for most children and adolescents with cancer. To date, the 5-year-survival rates have increased to 75% - 80% for the majority of childhood cancer patients in industrialised nations.